Facing headwinds that are muddling their missions and their budgets and luring away prospective students, college and university officials are adapting their campuses in big and small ways that they hope will help them navigate it all. From soaring, high-tech innovation labs that attract new students, to small-scale huddle spaces and digital campsites that foster the soft skills bosses increasingly want, colleges are building anew or repurposing existing infrastructure to meet the learning needs of today's college students. And flexibility is key. "More education is happening out in the field through immersive experiences and technology. This will cause campuses to fundamentally rethink their physical assets," says Traci Engel Lesneski, who led the team at Minneapolis architectural firm MSR, which designed the award-winning Visual Culture, Arts and Media (VCAM) building at Haverford College, in Pennsylvania. The college promotes the repurposed gymnasium as a "24/7 creative hub" that bridges previously siloed departments, packing in flexible work and collaboration spaces, offices, a high-tech presentation lounge and a communal kitchen. These spaces and others like them accommodate learning in two new ways. First, they are less focused on traditional lectures and isolated study and more on blended and online learning and collaboration. Professors may develop more sophisticated and interactive lessons, for example, especially considering that more students are likely to have one or more mobile devices in tow. Second, the campus IT infrastructure will get more sophisticated in response, such as through more charging stations, stronger WiFi or Internet service, and the use of augmented and virtual reality to expand education experiences. In a June 2015 report, the Society for College and University Planning (SCUP) found higher education administrators aren't planning well enough for these changes, especially concerning technology. When they surveyed more than 2,200 higher ed leaders involved in academic, strategic and other areas of planning, "IT or Technology Planning" ranked No. 12 of 15 areas based on effectiveness of planning at their institution, with a score of 5.8 on a 1-10 basis. 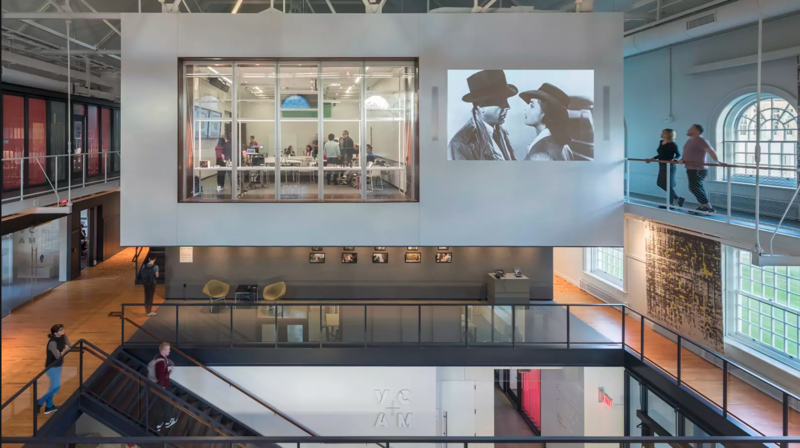 Haverford College's Visual Culture, Arts, and Media (VCAM) Building is a space for teaching and collaboration. There are a few reasons for that uncertainty. First is the yet-to-be-determined long-term impact of online learning on the need for large, sprawling residential campuses. The other concerns whether colleges should make dramatic changes and massive financial commitments to new facilities, or incrementally adjust to a changing landscape. At a 2017 meeting of SCUP's North Atlantic region, participants overwhelmingly said in a series of polls that residential campuses will slowly but surely adapt to include new technologies in newly built and renovated campus buildings such as libraries and residence halls. A small percentage of respondents said the pervasiveness of technology will create "a major disruption" to campus planning. "We will experience tremendous shifts in how we think about technology," said SCUP President Mike Moss. "The new norm will be planning as an ongoing exercise to allow a more iterative approach to allow for the integration of new supportive technologies." Some colleges are taking bigger steps. The VCAM building at Haverford represents a breed of campus spaces that experts say will become more common. The New York Times called them "deluxe structures for the generation of wonderful ideas" in a review of several, including the Stata Center at the Massachusetts Institute of Technology, The Bloomberg Center at Cornell Tech in New York City, the Lassonde Studios at the University of Utah and Northwestern University's Garage. They each vary is size and purpose, with some serving specific departments or projects and others the entire campus community. They have certain characteristics in common, however. Those include flexible meeting and work areas, food vendors, fitness centers and even child care. There is often also a focus entrepreneurship, particularly in those that include makerspaces, which are areas where people can gather for individual or collaborative hands-on work, particularly with projects that have a technical bent. Makerspaces may be fitted out with equipment such as 3D printers and CNC mills as well as computers with design and programming software. 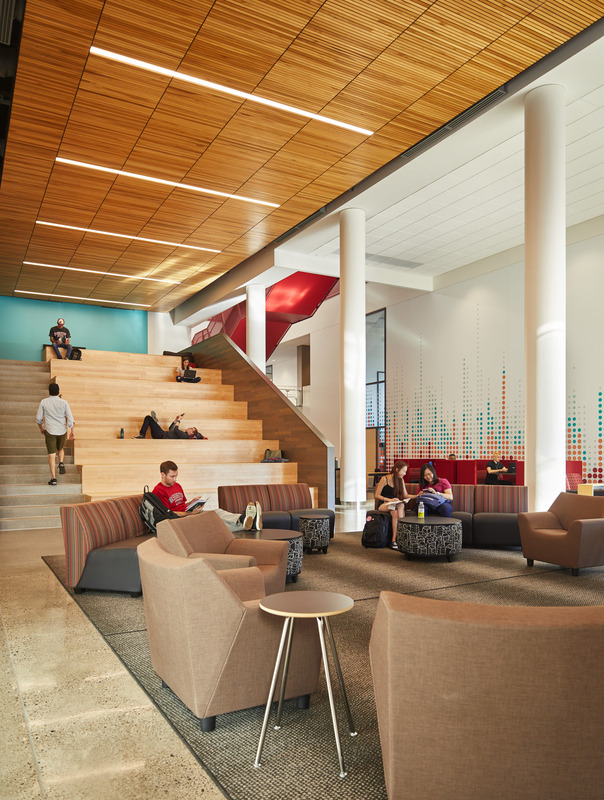 Washington State University asked that its new Spark building be designed with spaces to accommodate traditional and high-tech learning experiences. Another such facility, the 83,000-square-foot The Spark: Academic Innovation Hub Building at Washington State University, falls in the middle of that spectrum. The Spark features a network of small learning spaces and work areas — formal and informal and for groups of all sizes — that are connected to an open common area. A separate, 277-seat rotunda-style lecture hall has 360-degree screens using nine projectors suspended overhead. It has the capacity to record, video conference and stream video. To ensure their investment in the new building would serve the campus community for the long term, university officials asked the building's designers to create spaces that maintain traditional ideas about learning as well as those that respond to new thinking on reducing the focus on traditional lectures and isolated study, ZGF Architects principal Dan Simpson said. "They wanted classrooms that would foster hands-on, project-based learning in team settings where students are refining and exchanging ideas and information and solving problems in real time," he said. "More education is happening out in the field through immersive experiences and technology. This will cause campuses to fundamentally rethink their physical assets." Simpson points out that it was important the IT staff, often relegated to an isolated area of the building, be prominently located in a facility with so much technology. In Haverford's VCAM, the IT team is located in a suite where students and faculty not only can work or get assistance from a help desk, but also can attend seminars and training to help them make the most of the facility and its equipment, which they increasingly and more creatively do. Meeting the increased internet and power needs of students and faculty members using multiple electronic devices was also a consideration. The building is "saturated with wireless access points to meet any future needs,” said ZGF principal Taka Soga. Digital campsites — or, smaller areas with monitors and easy connectivity — are offered in a pair of lounges designed to respond to yet-unforeseen uses for the technology. "The idea is that we don't want to place any physical limitations on what the university can implement as modes of learning and teaching continue to evolve alongside technology," Soga said. Those high-tech buildings dedicated to collaboration may be new to colleges, but many campus staples are also feeling the effects of new technology. Many libraries, for example, will adapt by reducing the size of their physical collections and creating new spaces for collaboration, ways to access online resources and even areas for naps. Thomas Hoover, chief information officer and dean of the library at the University of Louisiana at Monroe, initiated a de-selection process there and with the new space will have a series of booths with screens where small groups of students can work together. Other spaces, which he calls "alone but together" areas, feature individual study cubes placed near each other in an S-formation. The arrangement gives students privacy to work but they are close enough to each other to talk if they choose to. "In our research, these types of spaces are very popular among today's college students," Moore said. "Technology is the backbone of higher ed now and today's libraries need to reflect it," he said. Other common campus buildings should expect to see change as well. The traditional central dining hall could be replaced with several smaller facilities in residential buildings and other campus spaces. The Bridge for Laboratory Sciences features shared public spaces that helps connect two sides of Vassar College's campus. Department buildings, meanwhile, will likely incorporate shared public spaces, following examples set by buildings such as the Bridge for Laboratory Sciences at Vassar College, in Poughkeepsie, New York. 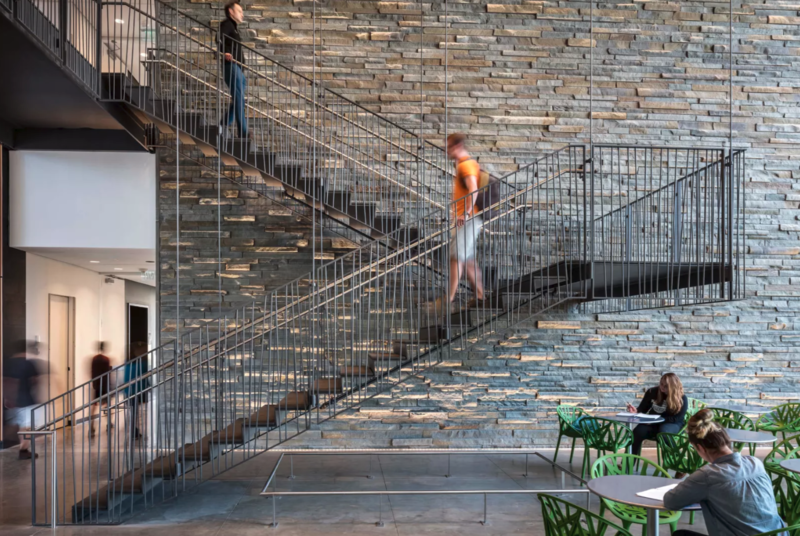 The building, which spans a creek and links two sides of campus, earned accolades from the American Institute of Architects in 2017 for connecting "students to each other, the sciences, the campus context, and the environment." The project's design process was also inclusive, incorporating multiple academic departments and faculty, staff and student stakeholders. "These multiple voices and interests were reflected in several aspects of the project and that sort of planning will be necessary in the future," says Marianne Begemann, dean of strategic planning and academic resources at Vassar. She said the designers wanted to break down what "at one time seemed like impermeable boundaries" by creating a space that the entire campus community could use. That sharing ranges from major pieces of instrumentation to tech labs as well as common social space, storage and offices, she said, forging cross-campus links and introducing others to the work being done by students and faculty members. Live-and-learn facilities where students and even faculty study and reside will increase in popularity and be oriented around social themes, bringing together individuals who are passionate about the same topics and issues, according SCUP's regional meeting survey. However, the longstanding residential college model may shift and implementing it effectively will require considerable effort on the part of universities, the survey found. Dickinson College, in Pennsylvania, has about 20 such special interest houses and expects to continue to add them, according to George Stroud, vice president and dean of student life. One of the latest additions is the X House, which celebrates black culture and opened this fall. "Its founders hoped that it would become a space where black students might gather for social, academic and emotional support," Stroud said. "Dickinson is becoming a more diverse institution and it is important that we value the cultural experiences of our growing community. Special interest housing, such as the X House, is one way of celebrating it." Dickinson also just completed new traditional dorm space, for which its architects took into consideration a number of factors gleaned through focus groups with students and staff. Those include places to gather, more privacy in bathrooms and study spaces outside of their rooms. "That sort of input is very important in the future," said Rhoda Kennedy, a principal with Deborah Berke Partners who designed the new dorms. She and other experts worry colleges are too readily investing in passing trends. "Speculation isn't all that useful," she said. "We think it's much more important to learn from campus communities and conditions on the ground."